To fight transaction laundering, we must familiarize ourselves with how these advanced crime networks operate. Profitable launderers operate like a legitimate business and can expose themselves through their Marketing, Sales, Receivables and Operation practices. 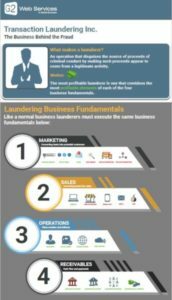 The most successful launderer is one that combines the most profitable elements of each of the core business fundamentals. By examining how launderers reach their customers, convert leads into sales and how they receive payments we will learn to combat them. If you have any questions, email info@g2llc.com.